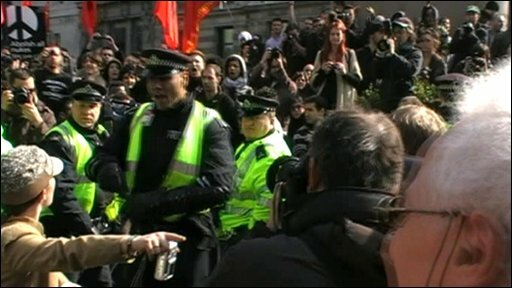 A Metropolitan Police officer accused of striking a woman with a metal baton at a G20 protest has been cleared. Sgt Delroy Smellie denied common assault on Nicola Fisher, 36, of Brighton, during the protest in Exchange Square, London, in April 2009. The officer told City of Westminster Magistrates' Court he feared objects in her hand were weapons. The Independent Police Complaints Commission said Sgt Smellie could still face police disciplinary action. District Judge Daphne Wickham found no evidence had been provided to show use of the baton was not measured or correct. She said: "It was for the prosecution to prove this defendant was not acting in lawful self-defence. "The prosecution has failed in this respect and the defendant has raised the issue of lawful self-defence and as such is entitled to be acquitted." The trial of Sergeant Delroy Smellie came down to one question: At one point can an officer use force? The law is quite simple in this area and is designed to allow people who have used force to argue that it was legitimate. That means police officers can use force - including in some situations lethal force. The level of force deployed has to be reasonable in the specific circumstances of the moment and the prosecution have to prove beyond reasonable doubt that the individual was not in genuine fear for his safety. The police watchdog received 296 complaints about officers involved in the G20 protests - and 83 of these were allegations of excessive force. Nicola Fisher's complaint grabbed the headlines because of the footage - but the G20 row is, however, far from over. Prosecutors have spent some six months looking at the death of Ian Tomlinson. They are yet to decide whether to charge any officers over that incident. The judge said Sgt Smellie had a "mere seven seconds" to act when Ms Fisher ran in front of him hurling abuse at a vigil held on 2 April to mark the death of newspaper seller Ian Tomlinson at a previous demonstration. Mr Tomlinson, 47, died after he was pushed to the ground by a police officer during clashes on 1 April. He had been walking home from work and was not part of the demonstration. Judge Wickham watched video footage of the incident and looked at numerous photographs before coming to a decision on the case, which was heard without a jury. She said circumstances meant the officer was not able to use CS gas and could not call for help from the police cordon. She pointed out that Sgt Smellie had deliberately bent his knees to hit Ms Fisher on her legs, causing a "transient flesh wound". Judge Wickham added: "I am satisfied he honestly believed it was necessary to use force to defend himself." Ms Fisher, who did not give evidence at the trial because she feared her lifestyle may be raised by the defence, said she was "disappointed" by the verdict. She added: "I'm just glad it's all over. It has been a nightmare. "I stand by what I said." The Crown Prosecution Service had claimed Sgt Smellie lost composure because of Ms Fisher's aggressive behaviour. It argued he was justified in pushing her back and striking her with the back of his hand but claimed he went too far by striking her with an extendable metal baton. 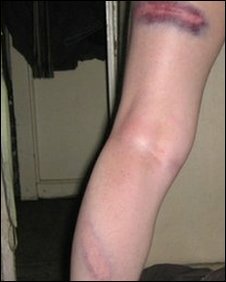 Ms Fisher was left with severe bruising to her leg. The incident was later viewed by thousands on internet video sharing website YouTube. Sgt Smellie smiled and gave two thumbs up to his supporters as he was cleared. The experienced officer, who had claimed he mistook a juice carton in Ms Fisher's hand for a weapon, had always maintained his actions were proportionate. He refused to comment on the outcome of the case, saying: "I don't think so, I have got a reputation to protect." Deborah Glass, of the Independent Police Complaints Commission, said Sgt Smellie could still face Metropolitan Police misconduct proceedings. She said: "People were understandably concerned when footage of this incident was played on the internet and it is right that the actions of the officer were put before a court. "Following today's decision, we will submit our report to the Met for their consideration in relation to any appropriate misconduct sanctions." Sgt Smellie, who was suspended during the trial, has been reinstated and can go back on duty, Scotland Yard said. A spokesman said: "When we have seen the IPCC's recommendations we will consider whether any misconduct proceedings are appropriate. "